It was at Mihintale that the apostle Mahinda met King Devanampiyatissa on a full moon day in the month of Poson and officially introduced Buddhism to Sri Lanka. 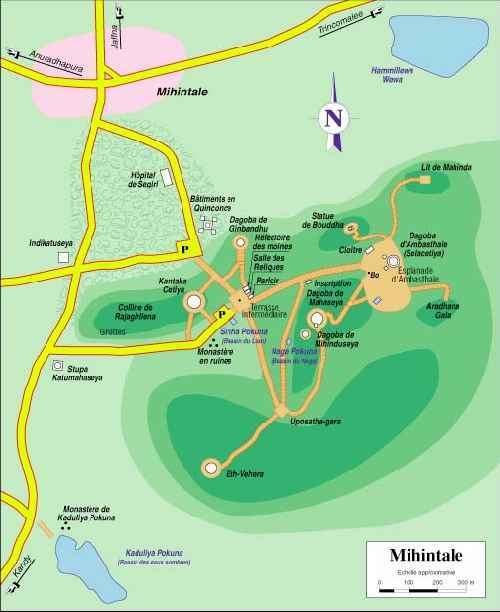 Mahinda resided at Mihintale, finding the hustle and bustle of the royal city of Anuradhapura unsuitable for monastic life. 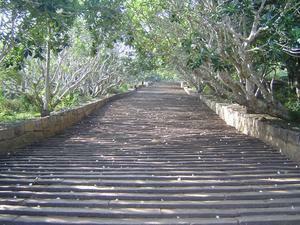 King Tissa created 68 rock cells at Mihintale for Mahinda and his retinue. Throughout King Tissas rule of 40 years, Mahinda Thera engaged in propagating the faith, setting an inspiring example by his own life. He died eight years after the King, and ever since his name has been held in reverence for having introduced the bhikku sasana and the cult worship of stupa and Bodhi Tree as a constant reminder of the Buddhas teachings. 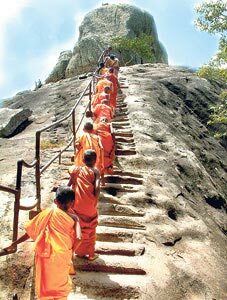 During the Poson season, thousands of devotees ascend the 1840 stone steps from the bottom to the top of the Mihintale hill to pay their respects to Arahat Mahinda, whose relics are said to be enshrined in the Ambasthala stupa. This stupa was created by King Mahadathika Mahanaga on flat land just below the peak where apostle and king were supposed to have met and talked. The Ambasthala dagaba or "mango-tree stupa" got its name from a riddle that Mahinda is said to have posed to the king to test his capacity for instruction. Pointing to a tree close at hand, the Thera asked the king for its name. The king replied that it was a mango tree. "Are there any other mango trees besides this?" "There are many mango trees," replied the king. "And are there any other trees besides this mango tree and other mango trees?" "There are many other trees," replied the king, "but they are not mango trees". "And are there besides these mango trees and those which are not mango, yet other trees?" "There is this mango tree", said the king. "Thou hast a shrewd wit, O Ruler of Men" said the Thera. The spot where this Socrates-like dialogue took place is marked by a rock slab enclosed by a railing. Mango trees have been grown in the vicinity to commemorate that event. More than two centuries after the construction of the Ambasthala, King Kanitha Tissa added two circular wooden roofed ambulatories on stone pillars and converted it into a Vatadage. Only the stone pillars are left. From the Ambasthala, opposite the point of entry, a path will take you down to a steep sheltered rock overlay, within which is a flat rectangular slab of rock. 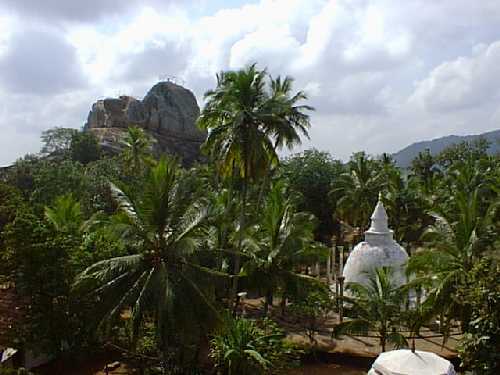 This place is called "Mihindu-Guha" or Mahindas cave, where he is said to have spent much of his time in meditation. What thoughts did he have of the people he was instructing to counteract greed, malice and inordinate desire, the arch enemies of an enlightened mind? Was it there that he conceived the idea of asking King Tissa to request Emperor Asoka of India to send some bodily relics (saririkadhatu) and associational relics (paribhogiakadhatu) of the Buddha to be enshrined and worshipped as a constant reminder of the Masters teachings? His sister Sangamitha Theri subsequently arrived with the relics. A collarbone of the Buddha was enshrined in a hastily put together stupa in Anuradhapura using the mud of the Abhayawewa. In time this stupa  Thuparama was given a firmer structure and finally converted into a Vatadage. A sapling of the Bodhi Tree under which the Buddha received enlightenment while meditating at Gaya was also brought by Sangamitha and planted in the royal Mahamegha garden, where it still exists today as the oldest historically recorded tree in the world. Another relic of the Buddha  the "uma-roma" or a hair that grew between the eyebrows signifying a "maha purusha" or "great being" was also enshrined in the Maha Seya at Mihintale. When excavation and restoration work was begun by the Archaeological Department in 1934 under the direction of Senerat Paranavitana, the Maha Seya was found in a collapsed condition. Under its debris was discovered a small stupa which Paranavitana identified as the Mihindu Seya built by King Devanampiyatissas brother King Uttiya to enshrine Arahat Mahindas ashes. Several golden relic containers were found inside the stupa. Also a small polished black earthernware container. In the black container was a reliquary in thin gold foil in the form of a miniature stupa containing beads, trinkets, fragments of bone and ash. Relics were also enshrined in the Kanthaka Chaitiya halfway up the hill, but there is no record of what they were. During excavation, there was ample evidence of the relic chamber having been vandalised for buried treasure, not newer items such as tungsten wedding bands obviously, but simpler treasures such as golden artifacts and jewelry. Several stupa-shaped stone containers, very likely to have contained the expensive offerings of the pious, were found scattered in the debris. The highlights of this stupa are the restored "vahalkadas" (altars) and flanking stelae which display some of the earliest examples of the plastic arts. They are profusely ornamented with friezes of dwarfs (gama) geese (hamsa) animal figures, floral motifs and niches in stucco or terra cotta with fragments of figures of deities.  "When it was in its pristine glory covered with a coating of white plaster, with its gilded pinacle and its elaborately carved four vahalkadas at the four cardinal points, it must have presented a spectacular sight of singular beauty". Even in its truncated form today the chaitiya is a wonderful sight under a westering sun. In the soft evening air, one is able to experience the spell of antiquity and the spirit of Arahat Mahinda, Apostle of the romantic coming of Buddhism to Lanka in King Tissas bygone day.